Kids say the funniest things… and the cutest and the sweetest things too. 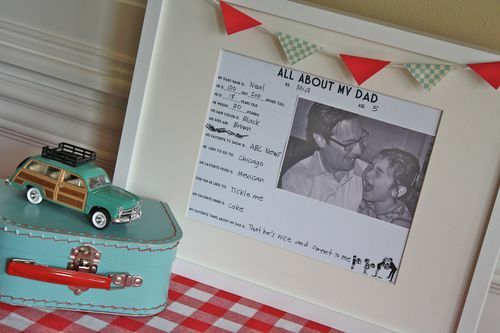 Here's a free printable for Father's Day. 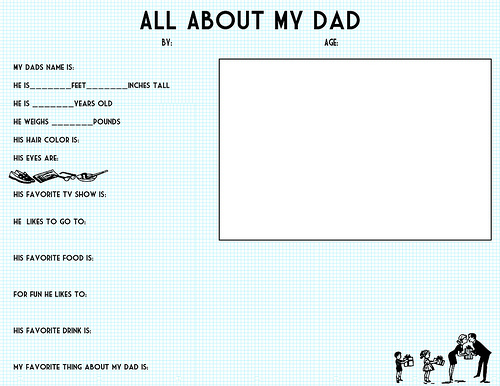 Interview your kid about their Dad (or if they are old enough to read and write they can fill this out themselves). Then frame it for a gift Dad can treasure forever! The printable features a few basic questions… that you might get very creative answers to. And there's a 4 x 6 spot to affix a photo or draw a picture. 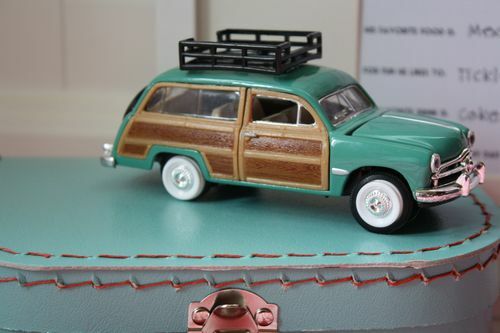 This reminds me of the wood paneled station wagon my Dad used to drive (not quite this vintage looking). 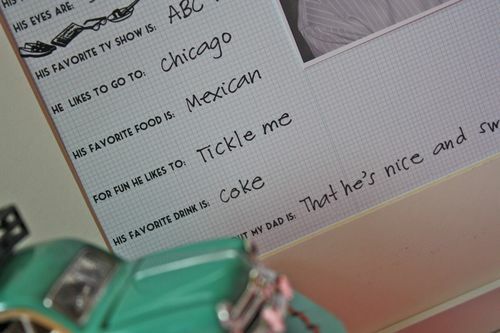 It's so precious how kids talk about their Dads. Hope you enjoy! 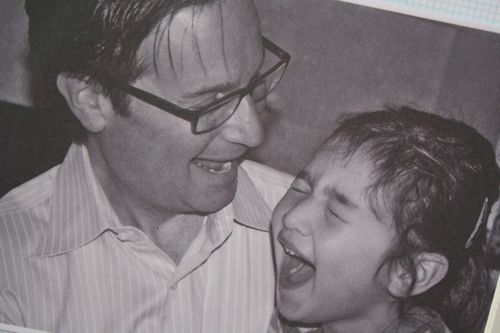 Here's to all the amazing Dads + Grandpas out there! Clip Art from Cathe Holden at Just Something I Made. Graphic Design by Keren Dukes from Free Pretty Things for You. Lovely post… nice picture!!! I just love this card especially for Dad!! I delicate this post to my sweet dad.. Thanks for this great post. So fabulous! Just shared on my FB page – http://www.facebook.com/AFOMFT. I was a pre-k teacher for 19 years. I did this sort of thing every year for mother’s day, and LOVED the responses I got from the kids. (not sure the mom’s appreciated it at the moment) But I’m sure they treasure them now. great tip to pass on! That is a really cute craft. I will keep this in mind for when my daughter gets old enough. Following you back via GFC from The Steady Hand. Thanks! following you back with gfc from ww link up! This is awesome!! Thanks for sharing this! I am definitely using it for Father’s Day! I am your newest follower- and I would love to have you follow me too! What a great idea. I’m going to try some of these questions with my 3 year old. Thanks for stopping by my blog!! Thank you SO much for sharing. My husband would totally love this. I have never downloaded anything from flickr before. Is it best to download and print the Large size of this file (the (1024 x 791) ?? Oh, this is a great project! I love it! I’m returning the visit and the follow! Thanks for stopping by! I used to do something like this with my second graders for mom’s on mother’s day. It was hilarious what they would come up with! I never thought of using a dad version. Thanks! Malia, I dig your style girl! I’m printing out your printable for both my girls right now! Many, many thanks! this idea is adorable. I absolutely love it. Can you make one of these for teachers? It would be a perfect gift/card for the end of the school year. wow.. daughter and dad have great time. 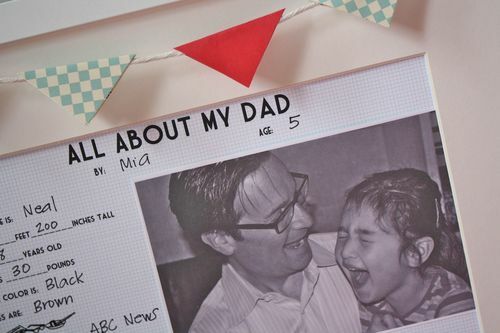 love the pics..
Q&As from kids are one of my favorite things for Mothers’ / Fathers’ Day … this one is absolutely adorable! Pinned! I love it! I made one up for the 16th to Dad from our cockatiel – that’s Dad’s ‘son’; we don’t have human kids!